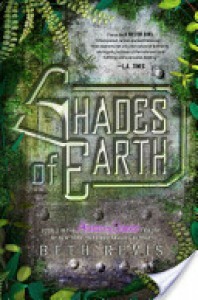 Shades of Earth picks up when Amy and Elder make the final decision about Centuri-Earth. Do they go or do they stay on Godspeed? That question is answered very much at the end of A Million Suns and in the beginning of Shades of Earth as well. Anyway… this novel had some serious twist and turns. The characters had to explore not only the planet, but what they were truly made of in situations that pushed them over the edge. It was a live or die kind of world they were thrust into when it came to the ship borns and the earth borns. This was due to the fact that it was a complete mystery what Centuri-Earth had in store for Amy, Elder, and everyone else. Orion was still playing games with the both characters. He left clues in a book and pointed them in directions on how to know what dangers were ahead. the very last clue was found by Elder and it painted a picture of WHY Eldest and those before didn't want to deal with Centuri-Earth and the FRX. One of the most pivotal and climatic moments in the story. This was one of the answers I received when reading this book that made sense about everything from the first two books. Amy and Elder's relationship was also put to the test, not only by the elements of the new planet, but by her own parents! Yes I said her parents. That's one of the very few spoilers I can give away. But it was also inevitable that they would show up soon in the series. Amy's father especially plays an important factor in all of this. And so does the character named Chris, who is a new character. I also just want to say that I'd like to punch Chris for his actions, choices, and lack of communication in general. If you haven't read the book yet, I can't say why because it revels the biggest secret of all! He's important to how the story is shaped and the outcome in the end. I'm sad about who died in this story. It broke my heart and so much more. It's been awhile since my heart strings were tugged by fictional characters. I wanted to save them, I wanted to save them all! But just reading it and picturing those moments in my mind… its' too much even now. Ugh! Beth Revis, WHY???? You did it again! It's rare for an author to do this to me. I'm also sad to say goodbye to this world, these characters, and the journey they are going to have even after all this is over. It was truly an amazing time to be invested in such a trilogy and worth every moment that came with it. I wouldn't trade it one bit. This is a series I would recommend to anyone who loves science fiction, a little romance, mystery, and the boundless world of space. It's everything a reader could want and more.